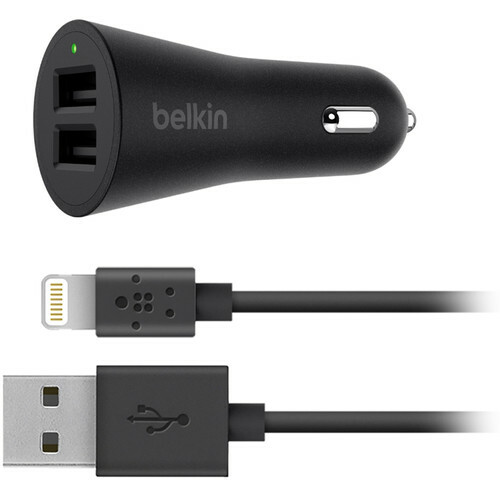 Keep your devices charged when you're on the go with the BOOSTUP 2-Port Car Charger with USB Type-A to Lightning Cable from Belkin. This charger plugs into your car's lighter port and features two USB Type-A outputs for compatible devices. These ports are designed to deliver up to 4.8A of total output power, with up to 2.4A for each port. The BOOSTUP charges lightning-enabled mobile devices like Apple's iPhone and iPad. This car charger also has a built-in LED indicator that signals when your connected devices are charging. Furthermore, the included detachable 4' Belkin Mixit Up USB Type-A to Lightning Cable allows users to charge and sync from a distance. Compact design allows easy transport and saved space in your car. Connect this charger to supported smartphones, tablets, smartwatches, and other devices that work with USB Type-A. The included Mixit Up USB-A to Lightning Cable is compatible with Apple devices such as the iPhone, iPod Touch, and iPad. Belkin will repair or replace electronic devices damaged by an electrical charge while properly connected to this charger, up to $2500. Box Dimensions (LxWxH) 5.3 x 4.0 x 1.5"
BOOSTUP 2-Port Car Charger with USB-A to Lightning Cable is rated 2.5 out of 5 by 2.